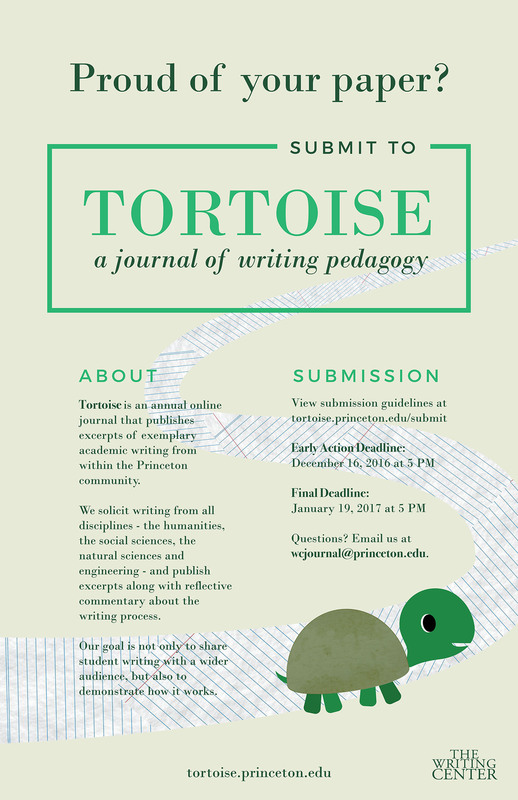 Tortoise: A Journal of Writing Pedagogy is an annual journal that publishes excerpts of student scholarship from within the Princeton community. Showcasing writers from all disciplines and at all levels—both Princeton undergraduate and graduate students—we aim to emphasize the writing process as much as its “finished” product. Excerpts of exemplary academic writing are curated with reflective commentaries on the research and writing methods underpinning the prose. Tortoise’s ambition is thus not just to share student writing with a wider audience but also to demonstrate how it works and how it was developed. PROUD OF YOUR PAPER? SUBMIT TO TORTOISE TODAY! Please refer to our “Submit” page for submission guidelines and tips.